About every 2 years the Proper Bostoninan Quilt Guild supplies nap quilts for a local daycare. I've been sorting my stash this month. I found a stack of orphan blocks from other projects and realized I had just enough of the picture album dog blocks to use as focus blocks for a toddler quilt. I also found two sixteen patch blocks I made as an exercise for Weeks Ringle's Craftsy class, Designing Modern Quilts. 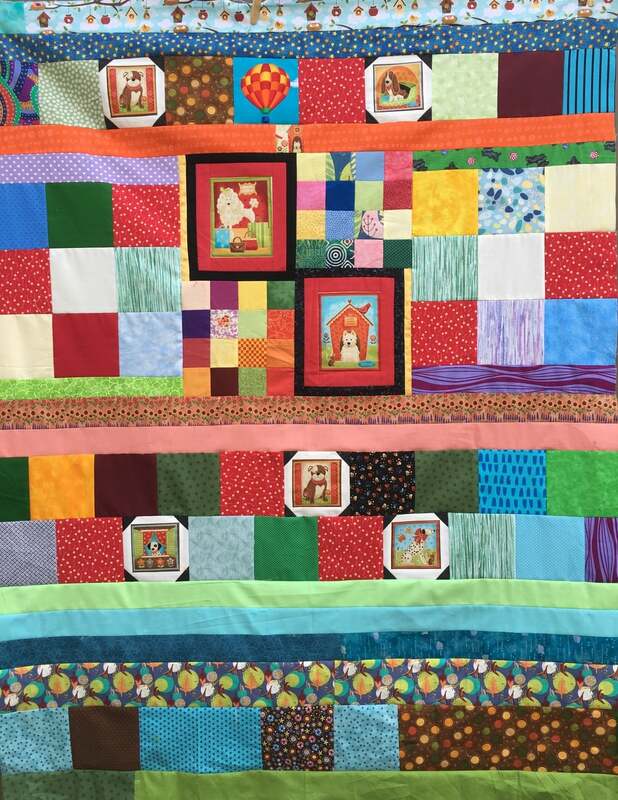 You can see them paired with the two large dog blocks in "picture frames" in the quilt top above. They fit in beautifully and I was so happy to use them! All the blocks came out of my stash of charm squares and 2 1/2 inch strips. I needed to trim some fabrics but was able to make this whole quilt top without cutting any fabrics! I found a dog print in my stash for the back. I needed to make it a bit wider for the quilt but found a scrap strip just the right length to do that! It was a fun challenge making this scrappy quilt. All the experience I got making Improv Quilts last year really helped me as I put this quilt top together.